Scenario 1 was the first installment in the Shining Force III trilogy and the first Shining Force game to be presented in full 3D. The game was first released in Japan and was later ported to the US and Europe. Scenario 1, unfortunately, was the only part of Shining Force III to be released outside of Japan. The game revolves around a conflict between two nations, the Republic of Aspinia and the Destonian Empire. At the start of the game, the two countries - whose relations with each other have always been tense - are engaged in a peace conference, held in the neutral city of Saraband, over the recent conquest of the land of Barrand - formerly part of the Republic - by the Empire's forces. Before the negotiations can be settled though, the Republican leader, Benetram, appears to have kidnapped the Emperor of Destonia, Domaric. This leads to the outbreak of war between the two countries, however, all is not as it seems - Benetram took no part in the kidnapping and has been maliciously framed by a bizarre religious cult. The hero of scenario 1 is Synbios, a young general in the Republic, who must first help Benetram escape from the city of Saraband, and later save his country from betrayl, secret plotting and eventual invasion. Battles are resolved in the traditional Shining Force manner, scraps are turn-based affairs on an isometric battlefield which is separated into tiles, your characters have to be maneuvered over the battlefields to fight with the enemy and there are many strategical options open to you. The battle system is simple to play and very rewarding (how many RPGs are there that actually have battles which are a joy to play?). As with other Shining Force games, when you attack or recieve blows from the enemy, the action is displayed in a dramatic combat scene. In previous Shining Force games these combat scenes were decked out in 2D graphics, however, in Shining Force III they are in incredible 3D (well, for a 32bit system, that is) and feature some great animation, dynamic camera angles as well as some impressive special effects. The game also introduces new elements to the battle system, friendships can be developed between your characters, which will increase the power of your troops, and characters can use several weapons - the power of which increase the more you use them! Shining Force III Scenario 1 is a great RPG experience, even if you can't get your hands on the other two scenarios as it plays as a standalone game as well as part of an astounding trilogy of games. The game is quite old now, however, and as it was released towards the end of the Sega Saturn's lifespan few copies were made. It's quite tricky to find the game nowadays but, if you're willing to pay quite a high price, there's usually several copies on sale (Japanese, USA and European) at eBay. The Japanese copies are easier to obtain than the english translated versions (and much cheaper), but even if you can only grab a Japanese copy, you'll be able to play the game in English as the game script is available online (see Shining Force Central). 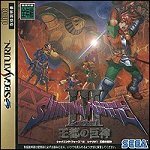 Jumesyn.net's complete walkthrough to the 1st scenario of Shining Force III. Brief introductions and descriptions of the characters from scenario 1. Reviews of Scenario 1 (as well as other Shining Force III reviews). Translations of elements of scenario 1 (such as the battlecries from the Japanese version) alongside other Shining Force III translations.